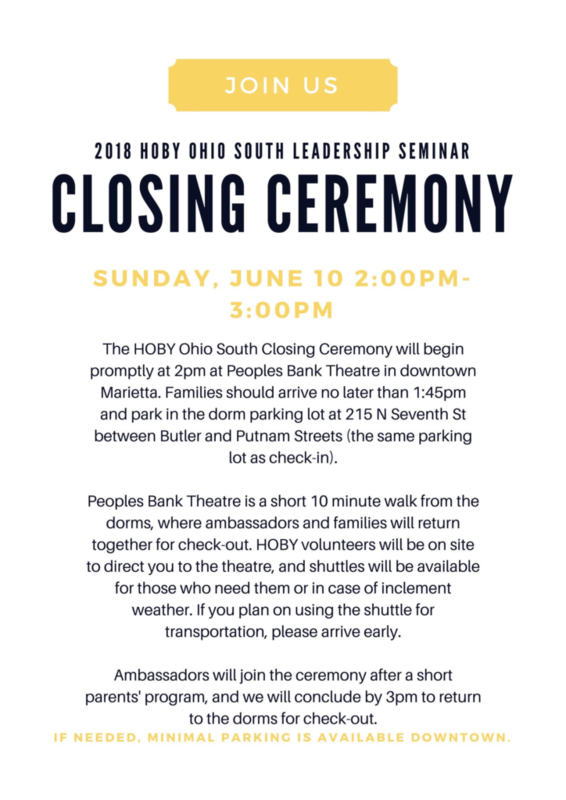 HOBY Ohio South | Closing Ceremonies are today! Can you believe the 2018 HOBY Ohio South Leadership Seminar is already coming to an end!? We provided information about our Closing Ceremonies in pre-seminar materials and at check-in, but wanted to provide you with some updated information due to a strong case of storms this afternoon. Drivers please consider dropping any passengers directly at Peoples Bank Theater at 222 Putnam St. Marietta, OH 45750. Then, drivers can return to the check in parking lot at 215 Seventh St to take a complimentary shuttle to the theater. Be sure to bring umbrellas! Shuttles for the return will be highly limited. Additionally, all HOBY families are invited to a Marietta College Admission Reception with cookies and punch before the parent’s program from 1:00 pm to 1:30 pm in McCoy Hall. Learn more about Marietta College and ask questions before attending the Closing Ceremonies. ← The 2018 Leadership Seminar is less than a month away!